Boca Chica hotel, condos, bars and clubs have proven enduringly popular being one of the 'original' Dominican resorts to develop along the South coast. We were born in the Dominican Republic, but still wonder how this place came to be named after ‘a young girl’s mouth’? (Although some visitors to the town might have suggestions!) But what can be claimed is that Boca Chica has had something to 'say' to many visitors for a few decades now. This south coast Dominican resort remains popular toady as it has been since it attracted wealthy Dominicans from the capital as far back as the 1960's. The closest resort to Las Americas International Airport, being just a quarter hour drive away, Boca Chica, sits at the very edge of Santo Domingo’s provincial boundary, close to Juan Dolio. Some 600 years or so ago the Boca Chica area was apparently an important site for the native inhabitants of the Island, the peaceful Tainos...but then along came Columbus! Much later, during the dictatorial years of Trujillo, the area began to develop as a favorite haunt of wealthy Dominicans desiring a break from their labours in Santo Domingo. As often happens over time, a seedier element began to insinuate its way into this centre for ‘hedonistic’ pursuits. Although Boca Chica accommodation options and lovely beach that has great family appeal, even today - when the sun goes down - there are numerous bars where company for lonely vacationers can easily be found for a price. Boca Chica is blessed by being host to a beautiful sheltered white sand beach. Shallow, warm waters cradled in the arms of a protective reef make it a perfect place for the ‘less-adrenalin-inducing’ water-based activities than Cabarete offers. So the setting is great for undemanding snorkelers and paddle-boaters! Though, true you can get out there on skis, and surf boards too, if that is your thing! But Boca Chica really comes alive as the sun goes down having a well established ‘night scene’ offering classy dining and other diversions...some of which, as stated, are still rather less ‘family orientated’ than other resorts offer! 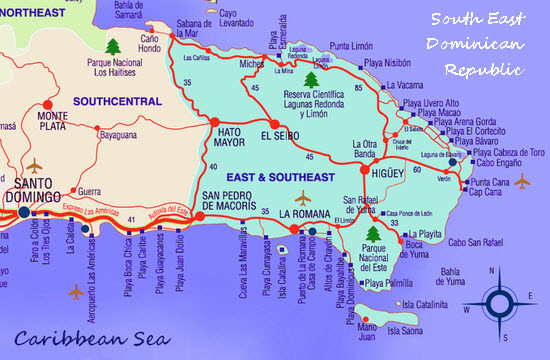 See also Juan Dolio a sister resort on the Dominican south coast. Enjoy your Boca Chica hotel stay! Have you been on a visit to the Dominican Republic and have a review of a resort, hotel or tourist attraction? We's love to feature your recent review of your experiences in the Dominican Republic so we can feature them for the benefit of other readers. It might be a review of your hotel, or all-inclusive complex, or rental accommodation. Or perhaps you have a toursitic service you'd like to recommed. Or a place of interest that you visited that others ought to know about. Your review will appear on a Web page exactly the way you enter it here (subject to any obvious small corrections if need be -- if we spot a typo, for example). You can wrap a word in square brackets to make it appear bold. For example [The Hotel#93; would show as The Hotel on the Web page containing your review. TIP: Since most people scan Web pages, include your best thoughts in your first paragraph... so that you 'hook them in'. We know they'll want 'the juice' if you provide it! If you've posted a youtube video of your visit -- include the link -- we'll try and post it on the page if we can to help boost your views.